Do you feel that your Windows computer sometimes takes millennia to respond to your commands? Do you get irritated every time your system takes a toll on you? If yes, then you need to admit the fact that your system is running slow and needs to be optimized. With regular usage, your system and browser create temp files, which can be used to recall a file faster from the directory in future. With time, if you don’t remove these temp files, they get accumulated and hog your RAM. 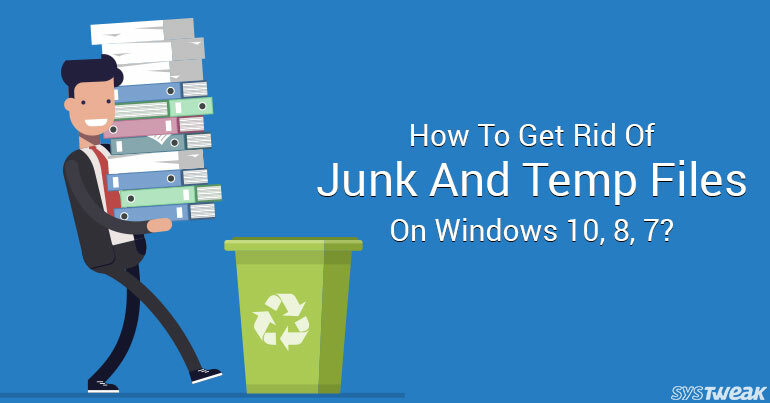 Although, Windows is a wonderful system as it has an inbuilt tool, Disk Cleanup to clean the junk and temp files on your system. However, using a third-party app can help automate the process and also remove all the junk files efficiently. In this post, we will talk about one of the best software Advanced System Optimizer to speed up your slow computer. Advanced System Optimizer is one of the most powerful cleanup and optimization tool available for all the Windows versions including XP. The awesome software comes with many features including the one that helps to get rid of junk and temporary files. When you uninstall an application from your system, it leaves its files behind it. You need to find and delete those files. Advanced System Optimizer works as a system cleaner and makes your system run faster and smoother by removing those old and obsolete files from your hard drive. Before performing the step, it also creates a system restore point to make sure that your system is safe. Moreover, with the cleaner disk, you get more space and fewer system crashes. Locate Disk Cleaner and Optimizer tab from the left-hand side pane. Once you are on the tab, navigate to System Cleaner and click on it. You will get two options Regular and Advanced. When clicked on Regular, it will scan the temp and obsolete files on your system, wherein, if you choose Advanced, it will scan your system in depth and look for uninstallers, defrags and more. Choose what type of scan you like run and click on Start Scan, it will scan your computer and display the results. Once you are okay with the scanned results, click Clean System to remove the junk. If you want to scrutinize the area of the scan, you can go to Settings. You will get three tabs, Regular, Advanced and Cleanup Options. All these options will give you a list of things that you exclude or include while scanning. You can also schedule the scan on the daily and weekly basis. Good news for game freaks, if you love to play your favorite game without any disturbance, then this tool will help you. With Advanced System Optimizer, you can convert your PC into a gaming center in a single click. All the notifications and incoming alerts would be blocked until you leave the game mode. Moreover, you can switch between computer and game mode easily. Isn’t it cool? Hardware and software go hand in hand and are equally responsible for the system performance. It is necessary to keep your device and system drivers updated. When the drivers would be updated, the system would work faster and smoother. The hardware manufacturers release a newer version to make sure the device doesn’t lag. However, you can’t possibly keep a track of it. Advanced System Optimizer resolves this issue as well. It scans and updates the outdated drivers. For safety purposes, it keeps a backup of current drivers as well. With all the security loopholes and cybercrime everywhere, it is mandatory to have a security software installed on your system. With Advanced System Optimizer’s System Protector feature, you have got it covered too. It monitors all the processes continuously on your PC and looks out for spyware-related activity. It keeps an eye on all the malicious activities and removes them before it’s too late. It blocks the entry of trojans malware and others and keeps your system safe. Disk Optimizer is one of the best feature of Advanced System Optimizer. The disk defragmentation is the process that organizes the contents of the hard disk used to store files into the smallest number of adjacent fragments. The biggest benefit of the process is that your hard drive would not have to work hard to access files and you would be able to access files faster. Regular usage will be very effective for your computer’s health. With disk optimizer feature, Advanced System Optimizer optimizes your disk to keep it running faster and healthier. So, in this way, by getting Advanced System Optimizer will make sense and reduce the hassle of maintaining the computer. So, go and get it now to make sure that your system stays healthy and fast. Travel Industry: Your Next Stop On The Block(chain)!